Another great day for families! 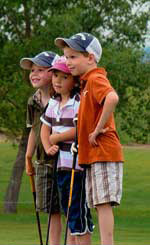 Each year the Legends offers free golf for kids 12 years and under on Little Legends Day. This year it will be held on Sunday, August 3rd, from 11am to 3pm. To help the kids with the play, rules, and etiquette, each group is accompanied by an adult “caddy”. Free hotdogs, pop, and prizes will also be availaible for the kids! No registration necessary.